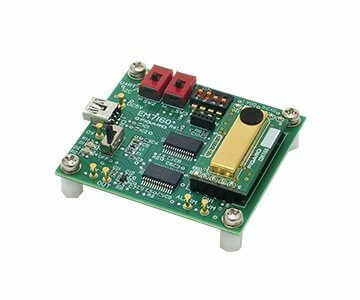 The EM7160 evaluation module is designed to facilitate evaluation of the characteristics of the CDM7160 carbon dioxide (CO2) sensor module. 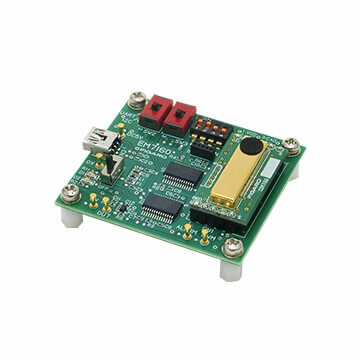 This evaluation module provides CO2 measurement data output in serial data format via a USB connector, PMW output, and continuous voltage output which is converted from the PWM output signal, simplifying testing of the CDM7160. With PC application software included in the package, serial measurement data from the EM7160 can be transferred to an external PC for graphically displaying real-time measurement data on a PC monitor. Measurement data are stored in CSV format in the PC and can be imported into other software such as Microsoft Excel (Note 3).